Fall … a Good time to Plant! Come autumn, many of us gardeners are tired and worn out, and welcome winter’s respite from watering and weeding. 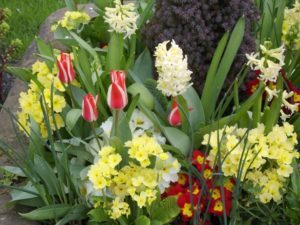 But experience nags us to plan ahead for something to welcome the coming spring with perky flowers that save us from the winter blues sure to come. It’s easy enough to push a few early-blooming bulbs into the ground or in pots on the patio. Nothing soothes cabin fever like crocus and snowdrops peeping through the snow, a cheery potful of tulips, a tucked-in clump of Scilla, or a drift of muscari and daffodils. Even a vase of fragrant paperwhites forced in gravel and water on the kitchen counter can get our juices going again. 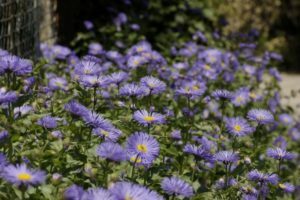 And of course there are some great cold-weather annuals, from faithful pansies, violas and wall flowers, to the intensely colorful foliage and spring flower spikes of kale. 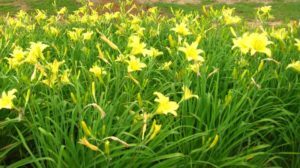 In a pinch, these can be reliable in themselves, or used to fill gaps between newly planted perennials which may not be as full the first season. 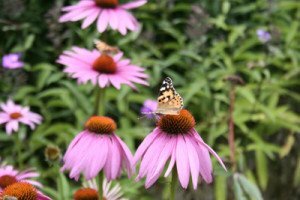 But to get the most bang for your efforts, choose and plant hardy, long-lived spring-blooming perennials to get a head start and something to look forward to for years without the annual fuss of replanting. Check our Special Offers for all kinds of helpful information to keep your yard and garden looking simply beautiful!